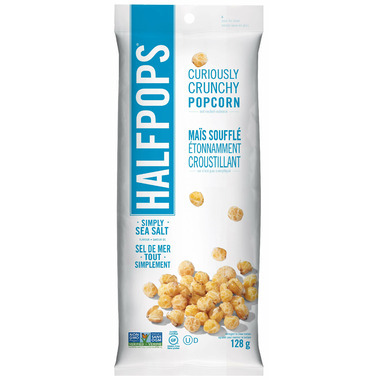 Halfpops Curiously Crunchy Popcorn Simply Sea Salt s not rocket science - it's simply half-popped popcorn! Ingredients: SIMPLY SEA SALT: NON-GMO POPCORN, NON-GMO CANOLA OIL, SEA SALT. These are AMAZING! Even better than the last crunchy kernels you would get in a bag of popcorn since they don't feel like they'll break your teeth. A must-try!